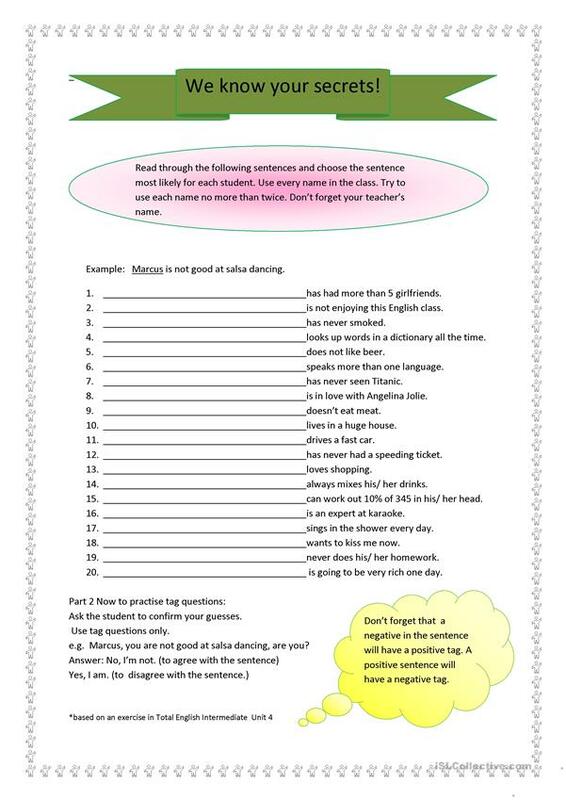 A whole class speaking exercise to practise negative sentences with tag questions. This helps with the dilemma of answering 'no' when you agree with something eg You don't eat cats, do you? No, I don't. The present downloadable worksheet was created for business/professional students, high school students and adults at Intermediate (B1), Upper-intermediate (B2) and Advanced (C1) level. It is aimed at practising Question tags in English, and is useful for strengthening your pupils' Listening and Speaking skills. joy2bill is from/lives in New Zealand and has been a member of iSLCollective since 2010-09-17 11:52:24. joy2bill last logged in on 2016-06-28 05:42:12, and has shared 2 resources on iSLCollective so far.